Tethras, based in Ireland, offers a turnkey localization service for mobile application developers. Their service takes the hassle out of the process, and enables developers to have their apps localized into many languages in one simple transaction. Localizing your mobile app using Tethras is a straightforward process. You upload your resource files and marketing materials to the service, select the desired language and service levels, and settle your transaction. Tethras then inspects your files for new source texts (they don’t retranslate texts that have already been translated), and sends them out for professional translation via their network of translators. Once the translations are complete Tethras production managers conduct QA tests to insure that everything is correct before sending the translate resources back to you. The company offers four different quality/price levels, which are: basic (10 cents/word), professional (18 cents/word, most popular service level), ultra (25 cents/word) and specialist (30 cents/word). Translations at all levels are done by bilingual people who are translating into their native language. At the professional level, the workforce is limited to experienced translators. At the ultra level, translations are cross-checked by a separate translator. At the specialist level, translations are done by subject matter experts who are not only translators, but also experienced in the chosen field. 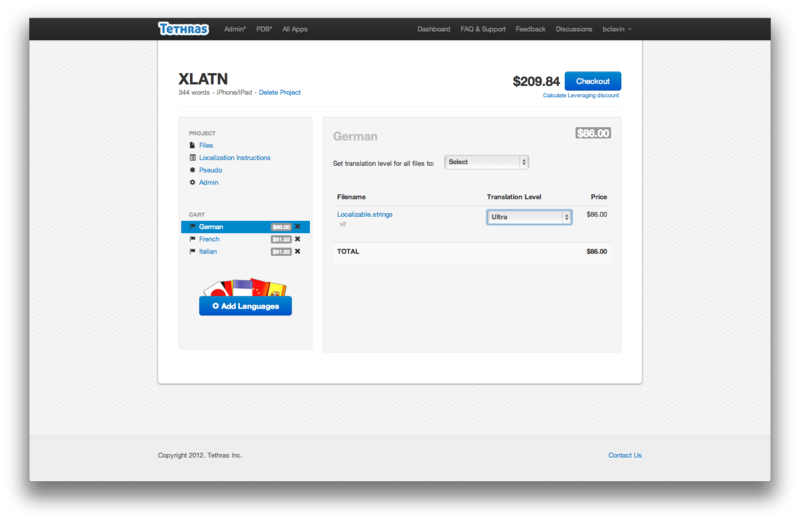 Developers can select from four different translation quality levels, with prices ranging from 10 cents to 30 cents per word. The service eliminates a lot of the complexity in translation projects, for example by automatically detecting new source texts (duplicate orders are a common problem with manually managed translation projects). Tethras also generates pseudo-translations at the time of the order, so you can verify that all of your strings are defined properly, and can spot common problems such as layout issues caused by differing word lengths. Tethras has also devised a very interesting approach to dealing with the “garbage in, garbage out” problem with app localization. 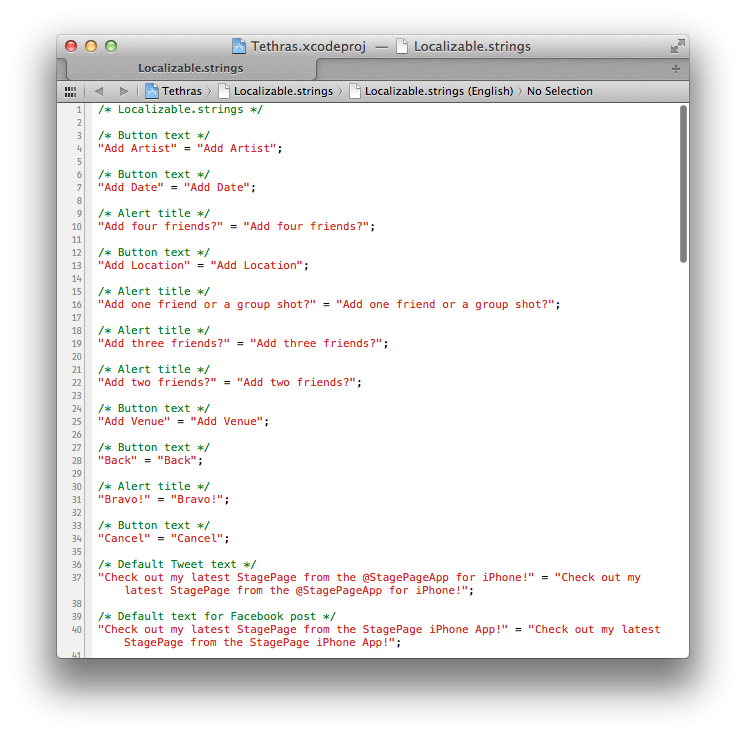 Specifically, developers rarely include comments that explain the context or intended usage of the strings and prompts displayed by their application (the localizable strings files used by iOS support comments, but are rarely used). This information is crucial to accurately translating these texts because they are typically very short, and can be easily misunderstood. Their system is set up so that if a text does not have comments, the translator can initiate a conversation with the developer from their workbench, to ask the developer what he meant with a specific prompt. The conversation is stored permanently so that other translators can see this information, which also cuts down on excessive communication between developers, translators and project managers. Tethras employs a similar process at the beginning of a project, for example so a production manager can question the developer about badly formatted strings before they are sent out for translation. One thing you’ll see throughout the translation industry is that its a specialist’s industry. Translators and translation agencies tend to specialize by language or subject of expertise. Service providers, like Tethras, tend to specialize in function, in their case on mobile app localization. What you won’t typically find is one “superstore” that is good at everything, in every language. Anyone developing mobile applications should look at Tethras along with a number of other solutions. Most small and mid-sized developers simply don’t have the resources to manage this process effectively in house. Traducto, by Visual Frames, offers a similar turnkey localization solution. 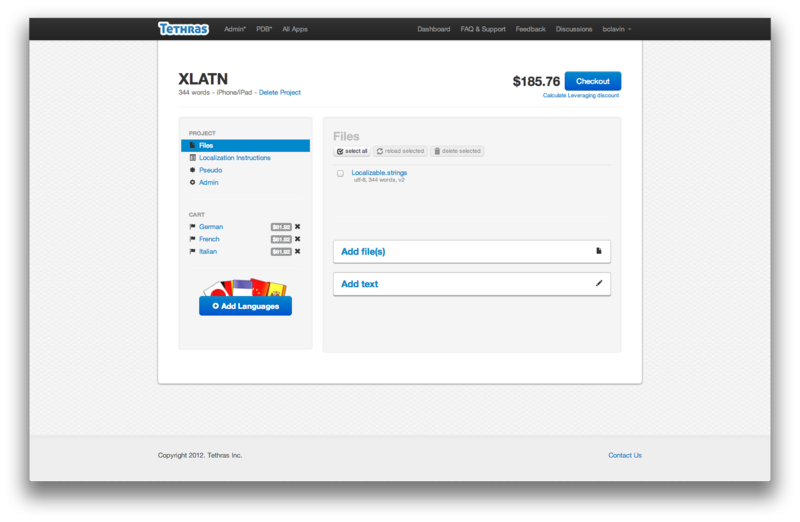 Transifex, a hosted localization management tool, a sort of Github for translation. This entry was posted in game localization, localization, mobile app localization and tagged localization, mobile, tethras. Bookmark the permalink.